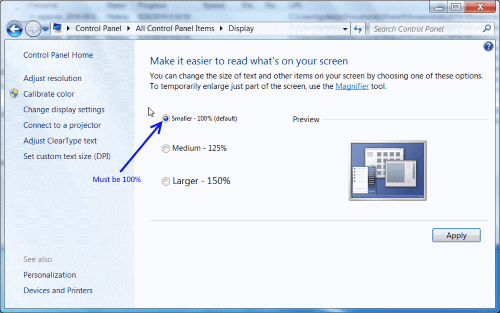 In early 2019, two users reported that mouse wheel scrolling results in the cursor position jumping to the upper left corner of the screen. Both reports were on Windows 10. 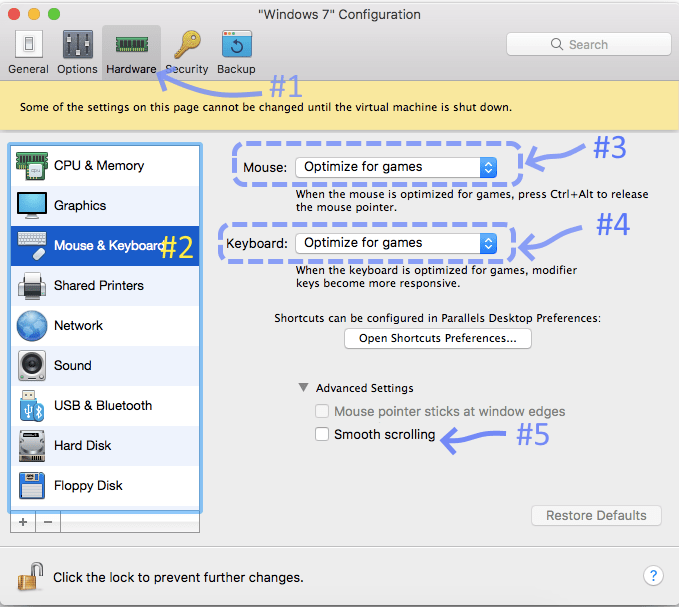 Open the SteadyMouse About window by clicking the Mouse cartoon image in the upper right corner of the SteadyMouse settings. Once there, repeatedly click the mouse cartoon shown in the image below. This will reveal experimental hidden settings (v2.3.2.0 and later only). Finally Uncheck the option for "Use Raw Input Stream Intercept Mode". After doing this, you should now be able to use the scroll wheel again without the cursor jumping. An official fix for this is being investigated as of April 2019. 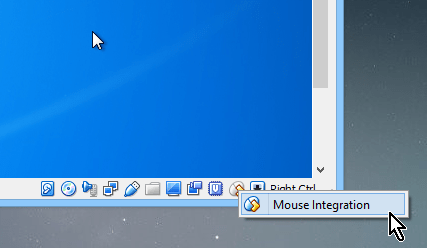 After downloading the SteadyMouse setup file, typically all you have to do is double click it to run the installation. Sometimes however, upon clicking, nothing happens. This is usually on Windows Vista due to some rough around the edges security features Microsoft later improved upon. Right click the SteadyMouse setup file and select Properties from the menu. Select the General tab. Then check for the existance of an Unblock Button near the bottom. If it is present, click it and then select OK.
After doing this, you should now be able to double click the installer and it should run properly. If it still does not run try downloading the installer using a different browser such as Chrome or Firefox. This issue occurs when Windows is unable to validate the digital signature on the application. "Digital signatures" are how Windows makes sure a file is not damaged or modified after you get it from original creator. Your computer's security "root certificates" are out of date and do not recognize the root authority used to sign SteadyMouse. The executable may be corrupt. If running on a company computer, your IT administrators may have chosen to limit the accepted "root certificates" installed in your OS. You are running ancient Windows Vista which has unresolved bugs with digital signature validation. Run "Windows Update" and reboot. This will make sure your root certificates are up to date. 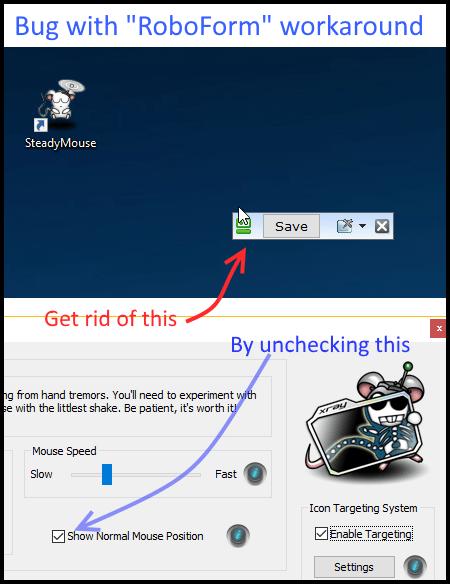 Download the latest version of SteadyMouse and reinstall (There is no need to uninstall first). If on a company PC ask your IT support for help and show them this page. Hopefully one of the above will get you back in business. If you still encounter this issue please contact support so we can investigate. Note: If the above all fails to help, a possible alternative Vista fix is documented on this Microsoft Support Page. In certain rare conditions SteadyMouse can lose control of the cursor. When this happens it flies to the edge of the screen and gets "stuck" in a corner. The user then has to toggle SteadyMouse off (via "Num Lock", etc), or just plain kill the process to get control back. 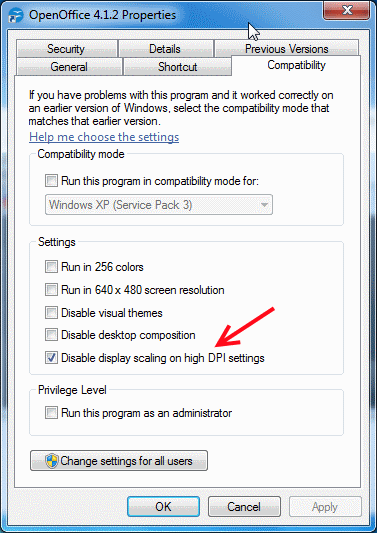 In almost all cases the issue is related to the configuration of Windows "desktop scaling and dpi" settings. Starting with SteadyMouse v2.0.6.0, nearly all cases are handled automatically and you will likely never even see this issue in the first place. If you do encounter loss of cursor control, please upgrade to the latest version as a first measure. Then, this page can take you further if it's still even necessary. Every version of Windows since XP has made unique changes to the ability to scale the size of the desktop user interface. This is known as "DPI scaling" and sometimes "desktop scaling" and is at the heart of the problem with loss of cursor control in SteadyMouse. Since every new Windows version is a little different from the last, it has led to multiple solutions to this problem. I'll show you each of them in order from simplest to most advanced and you're welcome to try the ones you like. They each have tradeoffs, however if you must know, "Solution #3" is my preferred choice. Reboot your computer for the changes to fully take effect. 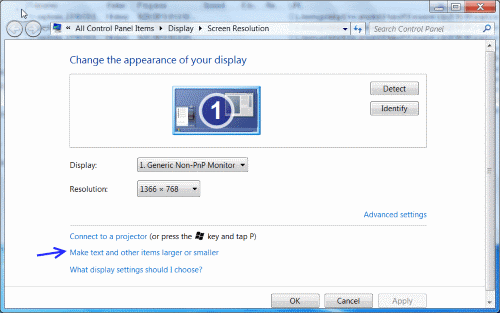 If SteadyMouse loses control of the cursor only when certain programs are running, and NOT on certain monitors altogether, then you are probably running Windows 7 or Windows Vista with a DPI scaling of 150% or greater. What you are seeing is a bug that Microsoft has since fixed in newer versions of Windows. Next time you upgrade Windows the bug will be gone for good, and in the mean time, thankfully, we have a workaround. The issue shows up when you run any application that is "DPI unaware" under the hood. This means it doesn't know about Windows DPI scaling and Microsoft's solution is to have the OS "lie" to it to make things sort-of work. When one of these "DPI unaware" programs has focus, it unfortunately interferes with SteadyMouse control of the cursor by feeding in wildly incorrect mouse coordinates. 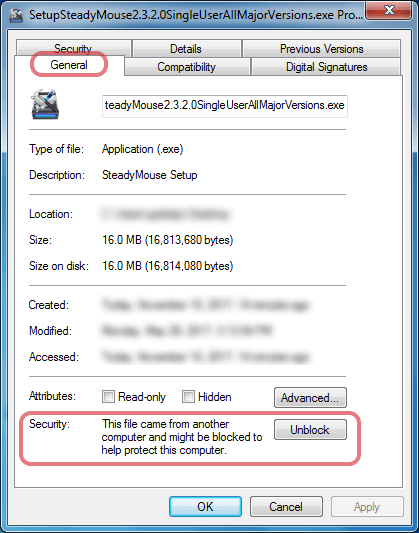 One solution is to track down every program that interferes with SteadyMouse, right click its icon, and select "properties"
Then click the "Compatibility" tab and check the box that says "Disable display scaling on high DPI settings"
Now that particular program will no longer interfere with SteadyMouse. The hard part however is finding all these troublesome programs and repeating the above steps for each one. FYI: You can also solve this by changing the system wide DPI to something other than 150% (100% or 125% works for instance). SteadyMouse v2.0.6.0 and later has a hidden alternate mechanism of controlling the cursor that is significantly more immune to interference from DPI scaling issues. This method will work in almost all cases, however it is experimental and has much less testing than the default original mechanism. Enabling it also requires a bit of technical ability, since it requires manually editing the SteadyMouse settings file itself. 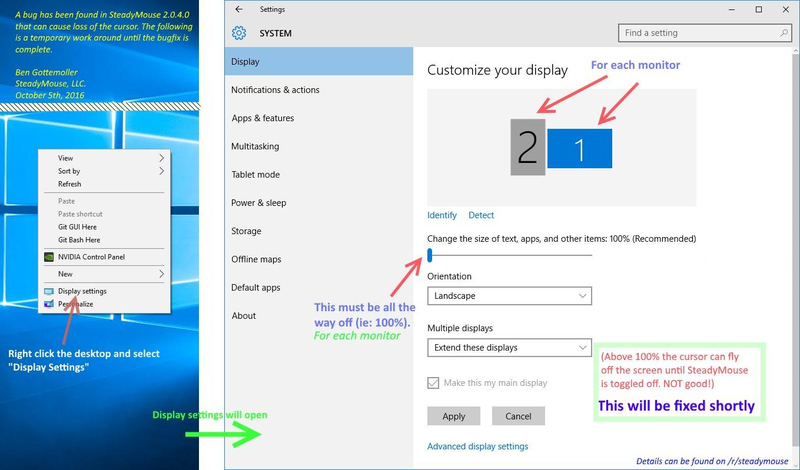 The upside is that, to my knowledge as of October 2016, this method works on all versions of Windows in all DPI setting scenarios, with any monitor configuration. If you try it and find anything amiss whatsoever, please send me an email so I can investigate. Before proceeding study the instructions here to become familiar with how to edit the advanced settings within SteadyMouse. 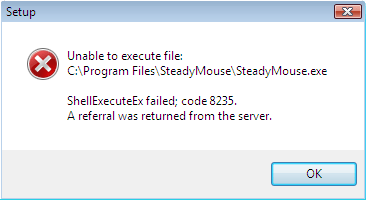 Once you have the settings.xml file open in an editor exit the SteadyMouse application. Back in the editor, we'll be changing two settings: "use_direct_cursor_injection" and "stream_interception_mode"
Run SteadyMouse and now all should be well on any DPI scalings you wish to use. You may notice that once in a while, when a certain application is open and has the focus, SteadyMouse stops filtering the cursor, and Icon Targeting won't find things inside that application's window. Windows "Task Manager" is one such example. This behavior is expected and has to do with security access permissions. 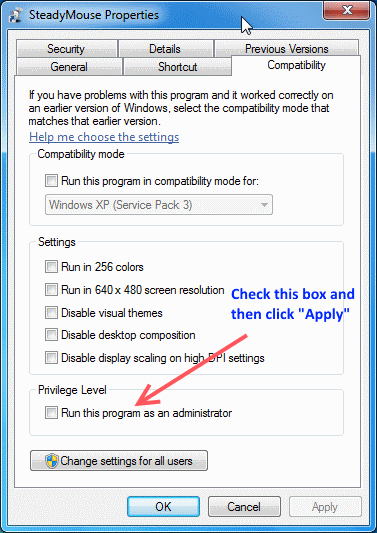 SteadyMouse runs with basic user privileges, and "Task Manager" for instance, runs with elevated privileges. Consequently, Windows is just doing its job correctly when it prevents these programs from sharing information. You will actually see this behavior any time SteadyMouse interacts with a program that is "Run as Administrator", or has requested UAC elevation and received it. Option #1 is to leave it as is, and understand that programs running with elevated privileges will interact in this way. For security it's best to have as few programs run with administrative rights as possible. Option #2 is to run SteadyMouse with administrative rights. You can do so by right clicking the SteadyMouse icon, selecting "Properties", and then selecting the "Compatibility" tab. Then at the bottom check the box that says "Run this program as an administrator" and click "Apply". You can also click "Change settings for all users" if you desire the change to be system wide. You will have to quit and restart SteadyMouse for this to take effect. SteadyMouse will filter the cursor for everything after this, as long as you launch it with the icon you modified. Note: If you have SteadyMouse set to start automatically with Windows, it may be necessary to perform the above change to the SteadyMouse icon found in the Start Menu's "Startup" folder (in addition to the desktop icon). Option #3 is to try running the "uncooperative" application as a normal user rather than administrator. Unfortunately, "Task Manager" and many other programs do not work without admin rights, so this path is probably the least feasible. If a program is running as an administrator and doesn't need to be, then you could of course just disable that. Option #4 requires upgrading to SteadyMouse v2.1.1.0 or later. Software updates have been made to deal with the issue automatically and unobtrusively. Simply install the newer verion and you're good to go. In any event, regardless of the route you take, the behavior is expected and nothing to be alarmed about. A user reported a situation where an application called RoboForm hounds the cursor with a toolbar whenever SteadyMouse is enabled! "RoboForm" is a tool for autofilling forms. After some experimentation it seems that this program is incorrectly thinking that the "Show Normal Mouse Position" crosshair in SteadyMouse is a form that needs to be filled in. It then places its RoboForm toolbar next to the cursor trying to be helpful. This end up being highly annoying to the user. 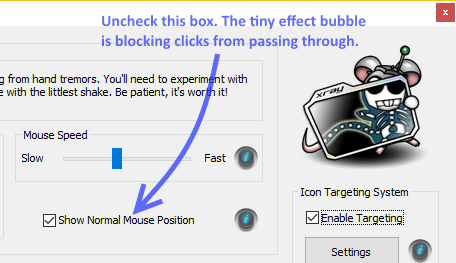 Thankfully there's an easy workaround until RoboForm fixes this: Turn off "Show Normal Mouse Position" in SteadyMouse. Open the SteadyMouse settings window and simply uncheck the box called "Show Normal Mouse Position". The RoboForm toolbar will disappear and you should be all set after that. Several users reported in early 2018 that "click & drag" to highlight text or move a scroll-bar was not working well on Windows 10. The problem began with Microsoft's Windows 10 v1709 update that automatically went out to users at the end of 2017. The bug is in the operating system and has been reported to Microsoft by both the libSDL and Chromium teams. You can find their discussions about it here and here respectively. It is expected to be fixed in Windows 10 v1803 that will be rolling out in mid-April, 2018. UPDATE: I have also reported this bug here to add more perspective. SteadyMouse 2.6.3.0 and later work around this issue so it is not necessary to wait on Microsoft to fix their end. Please upgrade if you have not already. Alternatively you can use the steps below to get reasonable improvement. "Use Raw Input Stream Intercept Mode"
Close the "About" window and you should find that "click & drag" now functions properly. A user reported a mouse clicking issue in the new Windows version released in April, 2017 called Windows 10 Creator Update. Apparently, in certain applications clicking the mouse button fails to do anything! Most notably, in the Edge browser. 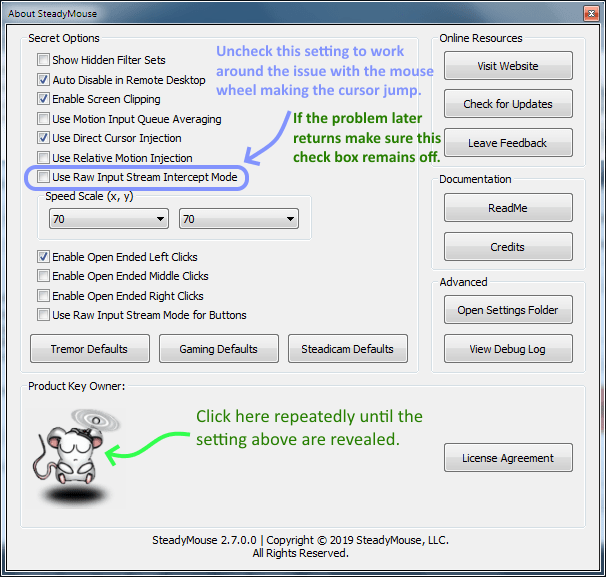 To fix the issue for the time being, open the SteadyMouse settings window and simply uncheck the box for "Show Normal Mouse Position". After some experimentation it turns out Windows 10 Creator Update is no longer respecting a particular property that makes a window transparent to mouse clicks. Special effects in SteadyMouse are done via transparent windows that are then drawn upon. Normally these windows are visual only, and act as if not even there as far as mouse clicks go. Unfortunately starting with the Creator Update, this is no longer the case. In particular, the transparent window used for "Show Normal Mouse Position" in SteadyMouse is receiving mouse clicks rather then letting them through to the window underneath. In other words, it is no longer truly transparent. Since it often sits underneath the mouse cursor, this becomes a significant problem. After a bit of searching I learned this bug has already been reported to Microsoft here. On my end, line of sight to a possible fix has been found and will hopefully be ready in the next release. 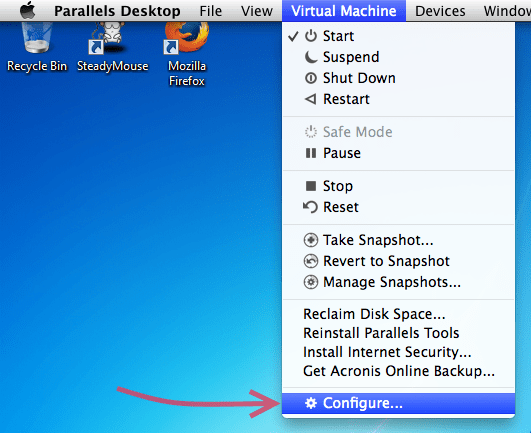 If you are running SteadyMouse in Windows within a Virtual Machine such as Parallels for the Mac, you may discover the cursor jumping all over the place after initial setup. This is thought to be caused by the way the the virtual machine takes over the mouse. Thankfully, fixing the issue requires just a slight adjustment to the Parallels settings. Start by navigating to the menu at the top, and selecting "Virtual Machine" followed by "Configure"
Select the "Options" tab, then click "Advanced", and finally turn "SmartMouse" off. Restart the VM and you should be all set. If you are running SteadyMouse in Windows within a Virtual Machine such as VMWare Fusion, you may discover the cursor jumping all over the place after initial setup. This is thought to be caused by the way the the virtual machine takes over the mouse. 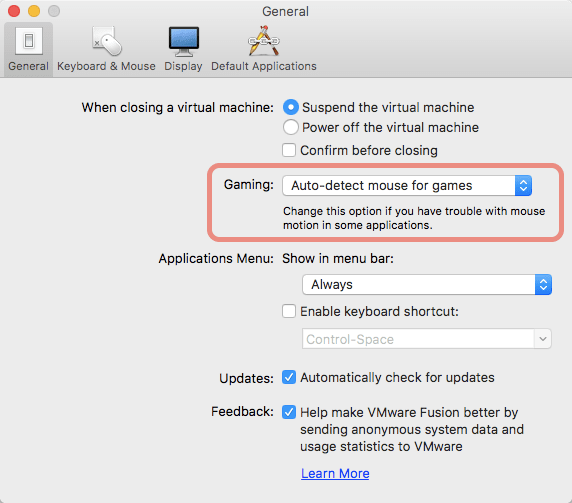 Fixing the issue should require just a slight adjustment to the VMWare Fusion mouse settings. Start by navigating to the "General" tab in the configuration. From there experiment with changing the "Gaming" mouse settings to see if the problem goes away. 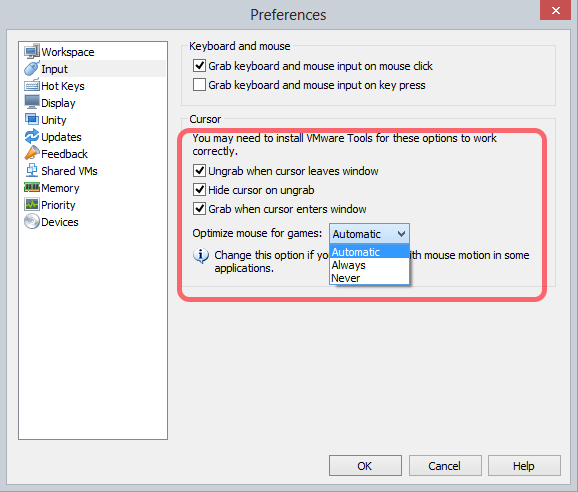 If still having odd mouse behavior, try turning off all checkboxes pertaining to "Grabbing the mouse"
Restart the VM and see if all is well. If you are running SteadyMouse in Windows within a Virtual Machine such as VirtualBox, you may discover the cursor jumping all over the place after initial setup. This is thought to be caused by the way the the virtual machine takes over the mouse. After doing this, click inside the main window and you will get a pop-up relating to mouse capture. Note that you will have to press a special hotkey to transition the mouse from within the virtualization environment back to your main OS. 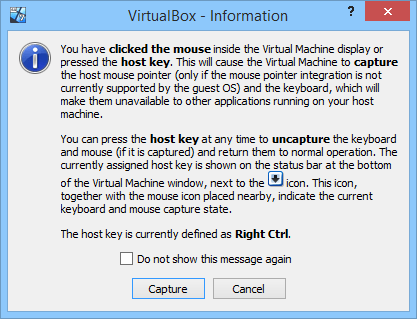 The default hotkey used by VirtualBox is RIGHT CTRL. SteadyMouse will work now when running within Windows on VirtualBox.